This first week of February has been providing us with some great action! 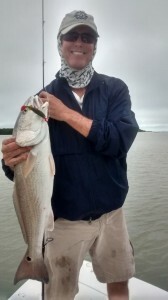 Today, when we left my dock in Everglades City, we headed toward the Houston river to do some redfishing. After anchoring up, it didn’t take long before a redfish hit a riptide jig! After a great fight, we landed a nice 10 lb redfish, that my clients would have the oyster house restaurant cook up for dinner. We caught several more nice reds, and then we decided to head to a nearby sandbar. While at the sandbar, we scored with several beautiful pompano and trout up to 4 lbs! Don’t miss out on great Everglades fishing! Give me a call, and let me get you out on the water for your next fishing adventure!